It was one of those early Saturday evenings in Los Angeles where it seemed that everyone had to be somewhere, and they were all 15 minutes late. Turn signals were, apparently, optional, and swerving without looking was de rigueur. On a night like this the 10 miles from the world headquarters to The Fix Burger location over in the Silver Lake neighborhood was a long and harrowing experience. It took 45 minutes to cover the distance, and I hoped that it would be worth it. The Fix Burger was a small space. It occupied a modest storefront on a busy street, and it was located next to a gym. It would have been easy to pass right by. There was metered parking on the street and a free lot behind the restaurant. The interior was plain and simple--a couple of tables, a long counter, a menu on the wall, and a register where one placed their order. 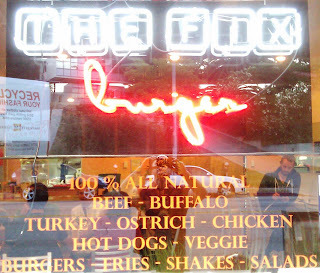 The claim to fame at The Fix Burger was burgers prepared from various exotic meats. Boar and Buffalo were as adventurous as the menu got when I visited. I ordered the lead item on the menu of about 15 burgers. This was the signature Fix Burger at $7.49--$7.99 with a slice of American cheese. It was Saturday night, so I went big and kicked in the extra 4 bits to live it up a little. While waiting the 15 minutes or so for my cheeseburger, I also noted that The Fix Burger was all about being green. The containers and utensils were biodegradable, and the beef was 100% natural...no hormones...no antibiotics...grass fed. The Beef: This was sourced from Myers Ranch. It arrived pre-ground from the supplier. The 80:20 Chuck was quite beefy, and it was nicely juicy. My burger patty quickly saturated the bottom bun. This was an 8 ounce burger, and it was 8 ounces of beefy goodness. No mineral or aged notes were present--this was just fresh, natural Chuck. 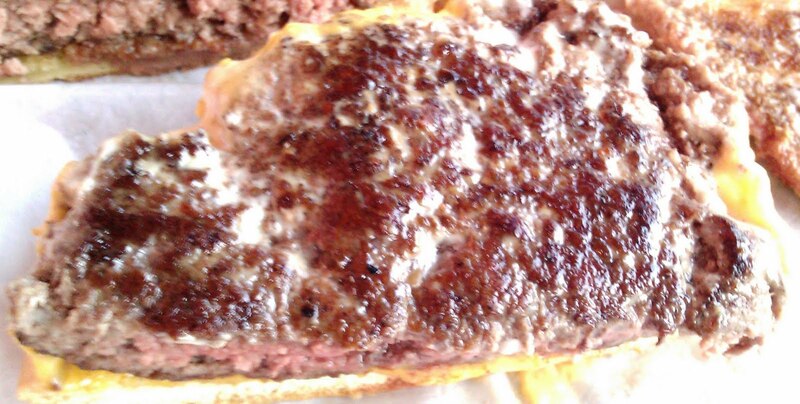 The Seasoning: The interior of the patty was unseasoned. 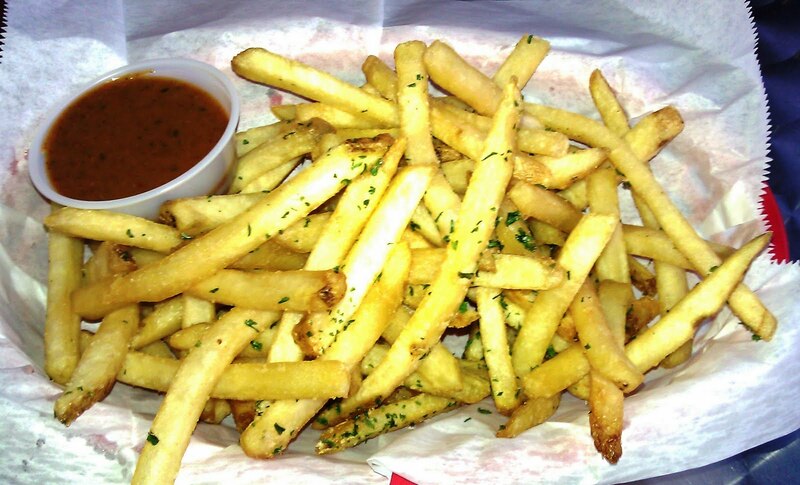 The exterior of the burger was dusted with salt as it cooked. The seasoning was appropriate for the flavor of the beef. The Sear: The Fix Burger kitchen got a sturdy and satisfying sear onto the burger patty. They did this with a hot flat-top and grilling weights. I was dubious when I noticed the grilling weights, but they did not dry out the beef. The sear was solid. The photograph does not do the sear justice. I ordered my cheeseburger sans mayo, but it arrived with mayo anyway. I wiped it off as well as I could. The Preparation: The Fix Burger took frequent delivery of pre-ground Myers Ranch Chuck. The Chuck was ground to medium coarse. The burger patties were formed into firm, 8 ounce, 1/2 inch thick discs each morning. The burgers were cooked to order on an appropriately hot flat-top with the aid of grilling weights. Judging by the juiciness of the end product, I would have assumed that each burger was only flipped once during its time on the griddle. 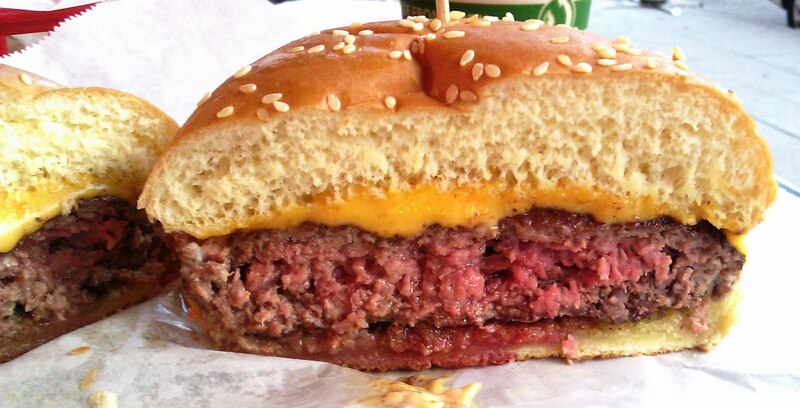 My burger arrived a juicy and pink Medium as I had ordered it. 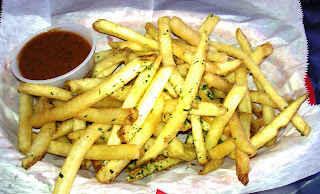 The Cheese: There were a number of regular ($.50) and premium ($1.00) cheese choices on The Fix Burger's menu. I went with American cheese. This was nicely melted over the burger patty. 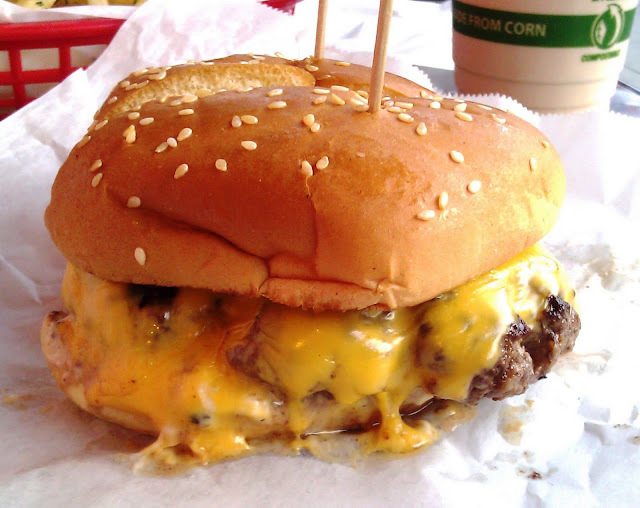 The creaminess of the American cheese coupled with the chewiness of the bun and juiciness of the meat created a very satisfying bite. The Bun: This was a seeded, eggy, white, hamburger bun from Restaurant Depot. It was a no-frills bun from that cash and carry wholesaler, and that no-frills bun worked just fine. It was nicely toasted, so that it provided a little crunch to go along with the sear from the beef. It was moist, fresh, and yeasty. The bun was quite good. The Toppings: The tomato slice was a little under-ripe, but the lettuce leaf was crisp and fresh. The Value: $8.00 for a better than average cheeseburger with no fries was a little steep. It wasn't egregious, but it was on the high side. The beef was from Myers Ranch, and that did come at a premium. Still, considering that the bun was cheap and the fries came out of a bag, The Fix Burger should have thrown a handful of fries on the plate to round out the value part of this burger equation. 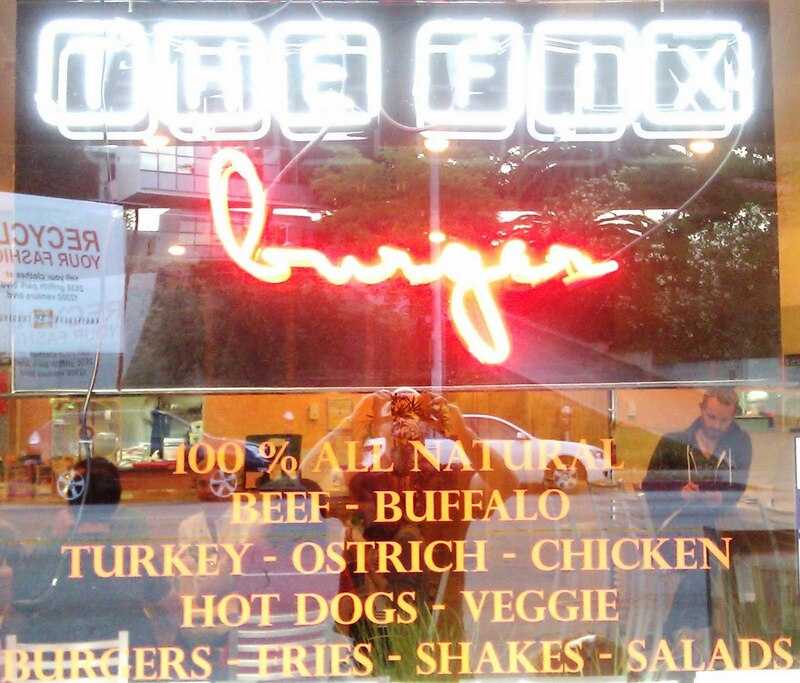 The Fix Burger was well out of the way for those living on the West side of Los Angeles, but for Angelenos residing in Hollywood or Glendale, this casual spot was convenient, and it served up a tasty burger and a tastier shake. Burger Review : A better than average burger for a slightly higher than average price.